There are no problems, no complaints. There are results of commitments. Some look good, some feel good, some don’t. How we’re committed and what we’re committed to; creates. I had my world rocked tonight, (again) by a world-class coach. My mind, my world, and soon my outcomes will be different than ever before. Dusan showed me distinctions, I was open to hearing them. And God handled timing. Dreams are things we are willing to take action on. They show up because we’ve completed the necessary steps. In fact, Dreams really arrive. They are here Now. Daydreams however, are ideas out in the ether. They involve actions and steps that we aren’t taking. They are life-sucking. Spending energy talking about things we’ll never do, is a waste. Here below, is the rushing madd writing result of that work. 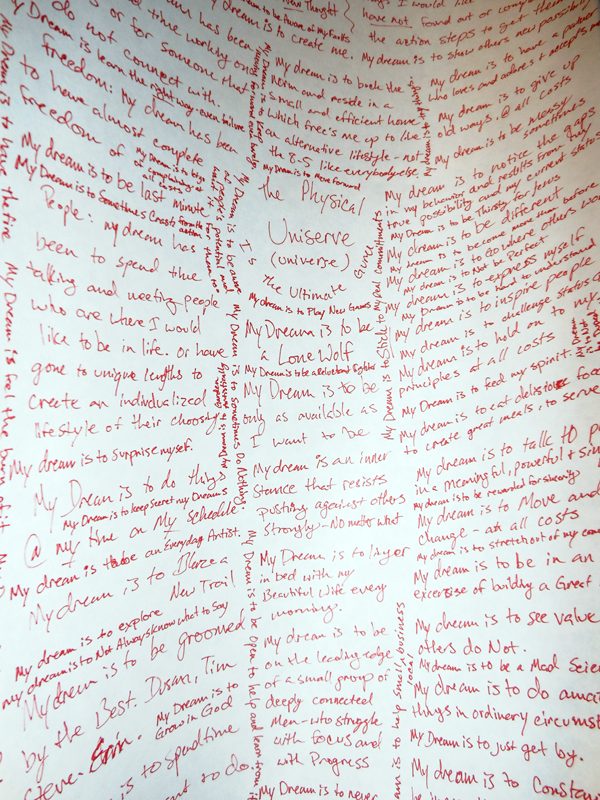 There are NO Daydreams on this paper. They seemed unimportant once I began. And I already have these Dreams Now. And now that I know them, I can play with them. A true mind-shift. Thanks Dusan. Back in the hard-partying days, we always knew it was going to be a looooong night of overindulgence, and extra rounds, when the theme became “Just One More.” The eyes would roll, and we’d all get a laugh out of the certainty that Just One More, it wouldn’t be! So what now, you ask? Am I Just One More(ing) about? This insidious little virus has crept it’s way into a few key areas of my life lately. This illusion of impeding activity and self delusion of a need to wait is crippling. All of these things that are put off, really do happen in the Now! Nothing happens in Future. It never arrives. Past is the same. Nothing can happen now in the past. It’s simply not changeable. Ever. Almost all thoughts of future are waste, as are almost all thoughts of past. What is happening Right Now, that we can take action on? This idea came to me as I laid in bed at midnight, playing Just One More (stupid) game of Angry Birds. I was attempting to wind down to sleep. My alarm was set for 4:30 am with intentions rise early and write a blog. I was going to do my writing in the future. I was extending my inactivity with each swipe and tap of Just One More (stupid) game of Angry Birds. It is the only way that my 11 1/2 Months of alcohol sobriety could have happened. No Quitting, No Forevers, No Commitment but what I could control Right Now. So, which way will we use this powerful phrase next? It could be the key to self-discipline or the procrastinational excuse to put off, once again, the life of our dreams. Guess what. Today is Your ONLY Day 🙂 Be Living! Watching a recent episode of Tavis Smiley online – My mouth dropped as actor, Jeremy Irons, used this phrase. He was answering a question about the value and importance of his voice, to his acting career success. Then he goes on to tell a joke of how to ruin a young actor’s career by getting them to think about their own voice. Wow. So, what do you think? If you dare to do such a dangerous activity?? In context, I believe he meant that to overthink or to be constantly aware of his voice would have been a distraction. It would shift his focus out of a free and natural acting moment, and into a worry-mode about the certain pitch or depth of his voice. I needed that advice. I do spend time Thinking. Is Mr. Irons exactly correct? YES. In and of itself, it is. It can consume and destroy. It cannot produce without physical expression. It is an impotent activity of self abuse, when done alone. Yes, of course I’m not suggesting to our under-aware world to quit all of their mental processes, and become automatons. But I will say that I am too often, in contemplation and insight. I am too rarely in action and movement. Experimentation and games and play is much healthier and produces results and is FUN! Mental circles. The past. An imaginary negative future. Are all wastes of energy. Thanks for checking into this weird world today – May you take this concept, skate quickly through the thoughts on it, and act today. Watch Actor Jeremy Irons on PBS. See more from Tavis Smiley. Our personalities are NOT permanent. Believing that we ‘always this’ or ‘never that’ is an illusion. Luckily, I started to test this theory a few years ago. By sheer stubbornness and even blind stupidity at times, I kept testing it. We can change, and grow and decide just exactly who and what we’d like to be. How would we like to show up today? How do we want our future to look? These are absolutely blank-canvas questions. Will we paint only a quarter inch square on the corner of our huge canvas of possibility? Will we stop when we get to the edges of new territory? Will we dwell in the same place as always, getting the same results as always? I ask these questions today, to remind myself that I too, at times, forget to keep pushing. Forget to test and try and travail. 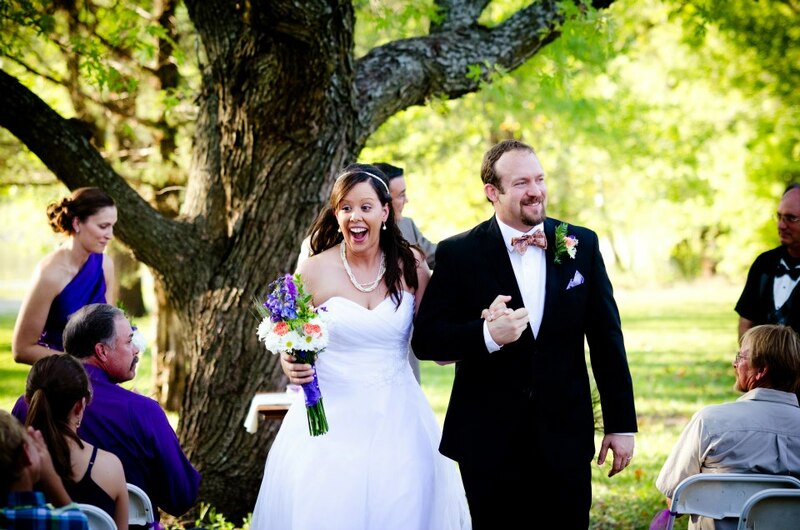 Although, I put up this picture of my beautiful wife, on our beautiful wedding day, 11 months sober, and truly blessedly happy, to remember that at one time in life, my ‘personality’ would not have ‘fit’ into this situation. It wasn’t quick, it wasn’t easy, but obviously, it was possible. Maybe that’s how miracles really work? They are available to you too. Right here, right now.